1913: a woman sacrifices her life for her cause, but what of the man who feels responsible for killing her? The King’s Jockey is set in the years leading up to World War One and examines how these exciting and turbulent times affected a man and his family. Caught in the glamorous world of royalty, racing and celebrity, Bertie Jones battles to keep a grip on his values and beliefs. This novel was inspired by the life of royal jockey Herbert Jones. 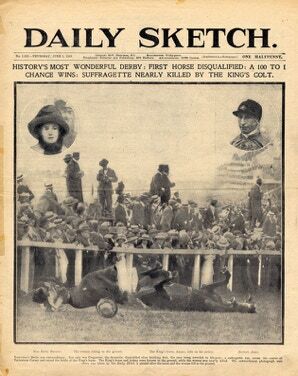 The story tells of Herbert "Bertie" Jones' rise to fame, his tragic collision with Emily Wilding Davison in 1913, and the dramatic events that followed. The King’s Jockey explores the evolving roles of the individual, the family and society. Set in a world of traditional values that is on the cusp of change, the story considers the issues of responsibility, loyalty, sacrifice and belief. Until now Bertie Jones has been just a footnote in a history book. Herbert “Bertie” Jones – royal jockey.